I was with the Governor, Senate President, and Speaker yesterday for the signing of this bill into law that supports manufacturers. RMI worked with the Governor’s legislative team and Commerce on tax incentives for job creation and relocation, accelerated depreciation and funding for training for manufacturers state wide. This is the most significant support from state government for manufacturing and for job seekers in decades. See Final Bill – RMI will have a forum to brief manufacturers on the details in plain language. Stay tuned. 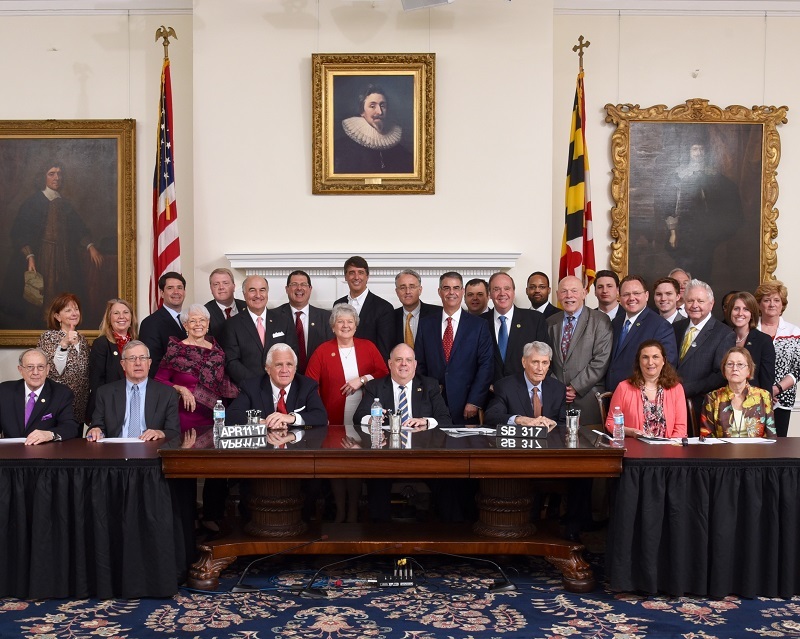 ANNAPOLIS, MD – Governor Larry Hogan, along with Senate President Thomas V. “Mike” Miller and Speaker of the House Mike Busch, today signed 120 bills into law during the first signing ceremony in the State House following the conclusion of the 2017 session of the Maryland General Assembly. The bills signed included top priority administration legislation to eliminate conflicts of interest for elected officials (HB 879) and enable the state to move forward with 73 top priority transportation projects (SB 307). The final bill of the signing ceremony was the governor’s More Jobs for Marylanders Act (SB 317), which was the centerpiece of his Maryland Jobs Initiative. The bill achieved nearly unanimous passage in both the House and Senate in the final hours of the session on Monday night. The legislation – which takes effect June 1, 2017 – provides tax incentives for new and existing manufacturers to create thousands of jobs, along with additional workforce development initiatives that the governor supports. New manufactures opening shop in high-unemployment (Tier 1) counties would receive a 5.75% wage tax credit, a state property tax credit, and a sales and use tax credit for ten years. The legislation also waives state filing fees, and all incentives are contingent on the company creating at least five jobs. Existing manufactures that create at least five new jobs anywhere in the state would also receive the same wage tax credit. The legislation also bolsters the state’s workforce so that Maryland workers have the skills needed to fill these new jobs. It provides $1 million in Workforce Development Scholarships for eligible students enrolled in job training programs at community colleges, and contains measures to encourage high schools to offer additional vocational training, as well as requiring state agencies to analyze their registered apprenticeship programs. This builds on the Hogan administration’s strong commitment to encouraging apprenticeships throughout Maryland’s nationally recognized Employment Advancement Right Now (EARN) workforce training program, which has already provided training for nearly 2,000 unemployed or underemployed workers.